Onondaga Council Seneca Face Whatsit? Here is another Whatsit? from Mike Hinman. 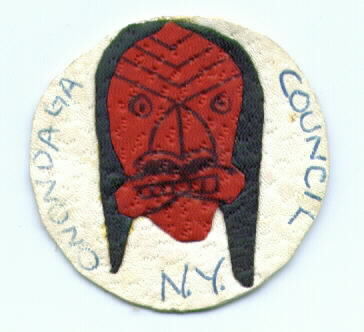 This one is a round patch with a Seneca False Face Mask and the words Onondaga Council hand written on the patch. The Senaca Mask was used by Senaca Lodge #394 out of Elmira, NY as well as Ga-Goh- Sa Lodge #547 from Olean, NY. Onondaga Lodge #516 which served Onondaga Council was headquartered in Syracuse and used the Iroquois Longhouse as their totem. While the Seneca were one of the tribes of the Iroquois, there are no known issues from Lodge #516 using this design. Can anyone shed any light on this? A district issue perhaps? This has all the hallmarks of being associated with “Seneca Lodge #394. I was an active arrowman in the early 80’s. Seneca Lodge was a small lodge with limited resources and frequently asked the Arrowmen to design event patches and other related material. The colors Red, White, Black, were the only colors used on the signature Seneca Lodge #394 OA flap. All indications are that this might be a prototype for an OA event patch for Seneca Lodge. 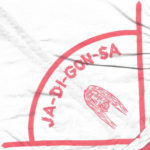 I have nothing in my collection that supports this other that what I witnessed as a member years ago. A few names come to mind to ask about this but I am reluctant to list their names here.